It is 18 months now since the 2014 Commonwealth Games finished in Glasgow. By most accounts the games were a spectacular success, with all of the sports on display getting great crowds attending from Glaswegians. At any sporting event now it seems obligatory to talk of what "legacy" the games have left behind, there is even a Legacy 2014 website extolling all the benefits the games brought to the city. Did it encourage people to be more active, seek out new sports to watch or participate in? I'm not sure. During the games I certainly went to see sports that I had never paid to watch before, but realise that, by and large, my spectating has largely fallen back to following Partick Thistle week in week out. My children still enjoy going to their assorted badminton, athletics and swimming clubs but we have not been spectators at any of these sports in the city since the games. The football league having a weekend break for the international matches meant that I was looking for other entertainment last weekend. This made me think about what other sporting excitement people of Glasgow find in their spare time, so I will try a few different sports and see if there is anywhere in town that can match Firhill for thrills. Last week I took my children to the ice hockey. This week we tried speedway. As the history of greyhound racing and speedway in Glasgow are so closely linked I will briefly look over both of these sports, which at one time were new and innovative, but both now evoke bygone ages. The origin of greyhound racing lies in hare coursing, and to try and make it a spectator sport a London venue devised a mechanical hare to lead the dogs along a straight track as far back as 1876. When a Californian track developed a mechanical hare going around an oval track in 1912 the sport of greyhound racing took off. Glasgow's first greyhound track was set up in Carntyne in 1927, on a site which has been derelict for decades just north of the Forge Shopping Centre, recently redeveloped for housing. After Wester Carntyne in 1927 came the White City Stadium and Albion Stadium near Ibrox a year later, then Shawfield put a dog track in place in 1932. Between 1948 and 1954 there was greyhound racing at Partick Thistle's Firhill Stadium. From 1928 many of these venues would introduce "dirt track" motorcycle racing on other nights of the week to boost incomes. Speedway, as it became known, as it requires a similar venue, has therefore always been associated with greyhound tracks. Shawfield Stadium on the banks of the Clyde is the only greyhound track in Glasgow still going. 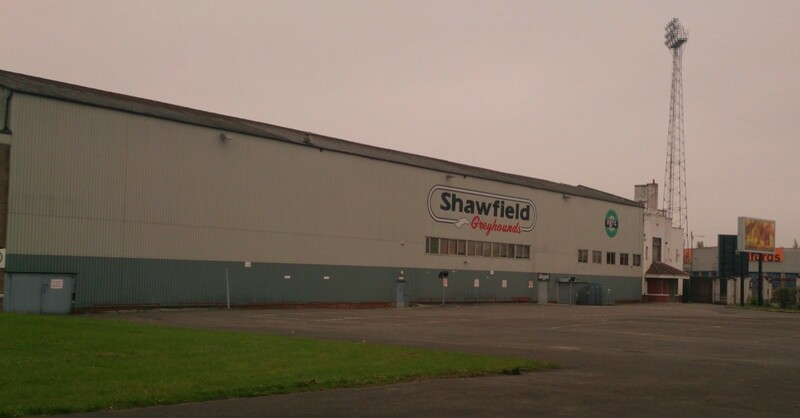 Shawfield was initially laid out as a trotting track, for horses. Football was first played at the stadium in the 1870s. Thistle FC were an Oatlands team and an early member of the Football League. They folded in 1895, only surviving in the record books as giving Partick Thistle FC their highest ever league win, a 13-1 drubbing at Firhill Stadium in the Scottish League Division Two. Clyde FC moved to Shawfield in 1898 and it was their home for another 88 years. The biggest crowds at the stadium were, for football, the 52,000 who came to see Clyde v Rangers in 1908 or, in other sport, the 40,000 who came to see local boy Benny Lynch beat Peter Kane in 1937 to defend his boxing world title. The Greyhound Racing Association owned Shawfield and planned to sell off the stadium to be developed as a supermarket. They moved Clyde FC out in 1986, who eventually settled in their unhappy Cumbernauld home. When the plans fell through GRA sold it to new owners who took in new tenants, the Glasgow Tigers speedway team who were based here until 1998. Since then it has only housed the greyhounds. Every Friday and Saturday night the races start about 8pm, with the doors open an hour earlier. There are a couple of bars and a wee restaurant within the stadium, which is a good venue for birthday parties and the like. My children think that the snack bar here does the best chips in town. I don't go often to Shawfield, but every time that I do go I think of my grandad and great uncle Andy, who lived nearby in the Gorbals and made occasional trips to the dogs here in the 1930s. My grandad's tip to bet on the black dog, or trap 5 seems as random and as valid as any other technique. A normal night will see about ten races, one every 15 minutes or so. Most races are handicaps with the dogs given a staggered start and ending at the finish line below the main stand. Once the dogs are paraded in front of the crowd you have your last chance to back a winner before they are placed in the traps. Like horse racing the point of going to the dogs is to have a flutter, and as with any betting you should only start off with the amount that you are prepared to lose on the night in your pocket, then stop. I'll wager that nobody has ever got rich betting on dogs. You can either place your bet at the various tote windows around the ground, or at the cluster of private bookies alongside the track, who may offer better odds. Betting options are a straight "win", usually minimum stake £1, a "forecast" - predicting first and second in the correct order (minimum stake usually 50p) or a "trio" - predicting first, second, third in the correct order (minimum stake 25p but the odds and returns are obviously much higher). You can place a "reverse forecast" selecting two dogs to finish first and second in any order (two bets at 50p, so minimum cost £1) or a "trio - all ways" predicting 3 dogs to come in the first three positions in any order (six bets at 25p, so £1.50 minimum stake). It's a good night out if there is a crowd of you, but attendances recently seem a bit smaller than they used to be. There has been some concerns raised about the welfare of dogs kept for racing, particularly what happens to them after their racing days are over. If you do have a big win maybe you would consider donating some of it to the Scottish Greyhound Sanctuary or the Greyhound Awareness League. The retired dogs make great pets and we have a friend who adopted a greyhound, a well loved member of their family now. Glasgow now only has one venue where speedway can be seen, Saracen Park or "Peugeot Ashfield Stadium" in Possil. This stadium was opened in 1937 and is home to Ashfield Football Club, who still play their home matches on the pitch in the centre of the track here. On Sunday afternoons however this is home to the Glasgow Tigers. The Tigers started out in 1946, but have only been based at Ashfield since 1999. Before that they have called various tracks home. White City Stadium in the 1940s, on and off through to the 1960s. Hampden Park from 1969 to 1972, then Cliftonhill Stadium in Coatbridge for four years, spells in Blantyre and Workington, before arriving at Shawfield Stadium in 1988. This was home for most of ten years before they settled in their current home. 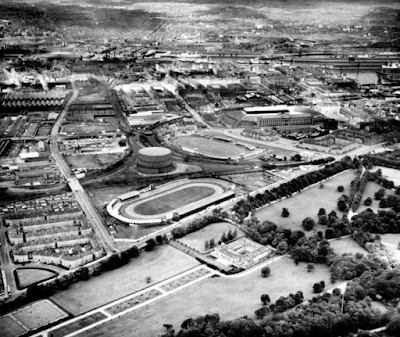 White City Stadium used to lie north of Bellahouston Park on the opposite side of Paisley Road West. It was finally demolished in 1972 to make way for the M8 and Govan Police Station. It was part of a chain which had greyhound and speedway venues in Manchester, Newcastle, Hull, Nottingham, Cardiff and London. In Glasgow the White City stadium initially had a grass dog track on the outside with a cinder speedway track inside it. There are some great pictures of it on the "Defunct Speedway Tracks" website. On the day we came to see the Glasgow Tigers in April 2016, the season had just begun and we were drawn by the chance to see them race against their rivals from the other end of the M8, Edinburgh Monarchs. The Monarchs are a team which dates back to 1928 and their existence has been as nomadic, and at times precarious, as their Glasgow rivals. Like ice hockey, this isn't a sport that started its life in the UK and many of the UK based teams are largely made up of riders from overseas. In the case of the Tigers this includes Australia, Finland, Argentina and England. The season starts in April and runs through until October with the Glasgow Tigers usually playing on Sunday afternoons at 3pm. There are 13 teams in the league, playing each other home and away over the season with play-offs at the end of the season for the top six teams, plus various cup and knock out competitions. Today's match was a league cup fixture, with Edinburgh the stronger team on last year's form. This was the first time I had come to see speedway, but the programme and compere easily guided me through the rules. As I am usually spending my Saturday afternoons watching Partick Thistle, the compere was a familiar face to me, with Michael Max providing matchday care to the Firhill crowd on Saturdays and the Tigers' fans the next day. Entertaining children is a big part of the afternoon here and before the racing started we were introduced to Roary the mascot and a parade of the teams on a flatbed truck before the racing starts at 3pm. Some fans turn up earlier, the doors open at 1pm, to look around the pit areas if that's your thing. The Tigers' name gives plenty of scope for tiger themed songs - "Tiger Feet", "Eye of the Tiger", and Katy Perry's "Roar" all featuring prominently. Every four or five races the track needs brushed and other entertainments are laid on, such as trying to throw a ball in Roary's bin and a children's race against the mascot. It is also a chance to grab some food, or get a drink at the bar. "That's neat, that's neat, that's neat, that's neat....I really love your tiger feet"
Spectators can stand around the outside of the oval track, or for an extra £1 per person, get a seat in the stand beside the start/finish line. There were 15 races in total, with four riders in each race going flat out for four laps. In each race the home team pair wear red or blue helmet colours and the visitors wear white or yellow. Points are awarded depending on finishing position, 3 points for first place, 2 for second and 1 for third. Nothing for being fourth or not finishing. If you are trailing by more than 10 points at certain stages, you can chose a rider to win double points in the next race, so there are various tactical shenanigans too. It is fast and furious and not without crashes. In the first race, with Glasgow's Nike Lunna taking a good early lead, the race had to be stopped after a Monarchs' rider crashed into the safety barrier. The rider was uninjured (although the safety barrier wasn't) and Lunna was unlucky to lose the restarted race. Even when a race looks done and dusted, mechanical problems can change everything. Tigers' Ben Barker seemed home and dry in the 14th race when his chain came off and he had to push his bike across the line to take one point. At the end of the day it didn't matter and Glasgow Tigers were comfortable winners by 56-37 to win the derby match. The pits behind the crowd, and an old Police phone box for the team manager? Overnight rain meant that the track was on the muddy side. As a result of this, finishing fourth in a race meant that a quick sponge-down would be required. The same was true for those standing along the home straight, who ended up caked in mud by the end of the day. However that, plus the smell of the burning fuel and the noise of the engines is part of the attraction surely. The racing can be very exciting, with plenty of nip and tuck. My children had a great time, I quickly got right into it. We will all definitely be back here again, especially if they promise to keep beating Edinburgh as soundly as that. Cost - Adults £17.50 each and children £1 under 11 years old and £6 for 12-16 year olds. So two adults and two children £42 plus £1 each to get a seat in the stand rather than just standing.